Like working in a cockpit. The CUBE_S product range stands out because of its new, top-quality solution for fixed workstations in compact office layouts. These workplace modules offer great comfort with individually customisable, sophisticated workstation organisation. They enable concentration and focus with great space efficiency in open-plan office layouts while simultaneously supporting teamwork with transparent elements and visual contacts. The desired visual and acoustic screening allows targeted control with varying cabinet heights. 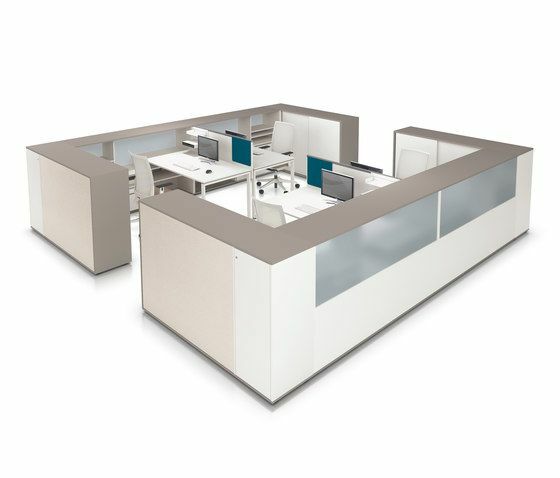 CUBE_S desks and storage elements can be configured to four settings. “Bridge” has lateral module cabinets, optionally as tower units. In the “Cluster”, the workspaces are enclosed by a large-volume storage space – for privacy at work. Four modular cabinets arranged in a star shape form the “Cross” layout. For the “Spine” setting, the desks are mutually attached to the module cabinet, which both sides can use for storage space. The utensils and documents are always within reach with all configurations. Horizontal surfaces, shelves and vertical pinboards can be selected according to individual requirements.